Dr. Adebayo joined CIPR on March 10, 2015. His experience is essentially focused on geological CO2 sequestration, CO2-EOR, petrophysics, and multiphase flow in porous media. From 2016 till today he has been an assistant research professor at CIPR. Ph.D., Petroleum Engineering, KFUPM, KSA, 2015. M.S., Petroleum Engineering, University of Port Harcourt, Nigeria, 2007. Multiphase flow in porous media, Petrophysics, EOR, CO2 Sequestration, and Geomechanics. 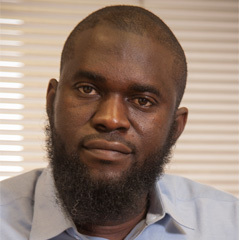 Adebayo Abdulrauf Rasheed, Al-Yousef Hasan Y., and Mahmoud Mohammed (2015). An Experimental Investigation of the Use of Combined Resistivity and Temperature Logs for Scale Monitoring In Carbonate Formations during CO2 Sequestration J. Energy Resour. Technol. 137, 032202 (11 pages); Paper No: JERT-14-1183; doi:10.1115/1.4028772. Abdulrauf Rasheed Adebayo, Hasan Y. Al-Yousef, Mohamed A. Mahmoud (2015), An investigation of the effect of CO2–brine–rock interaction on determination of Archie’s saturation exponent for carbon dioxide evaluation in carbonate reservoirs, Journal of Petroleum Science and Engineering, Volume 133, Pages 665-676, ISSN 0920-4105.